The Napier Golf Club was established in 1896, making it one of the oldest clubs in the country. The course was originally situated on the slope of Napier Hill but the club soon realised that golf was better suited to less extreme cambers, and moved to its current location at Waiohiki in 1903. In fact, the current layout is not greatly changed from that original, which was fit to host the first ever New Zealand Open in 1907 (won by amateur Arthur Duncan), and again in 1919 (won by E.S. Douglas). The Napier Golf Club was also home to a great lineage of early Maori golf champions, most notably Kurupo Tareha, the 1903 New Zealand Amateur champion, and his big-hitting son Kapi. A traditional Maori carving depicting the two can be found in the clubhouse. 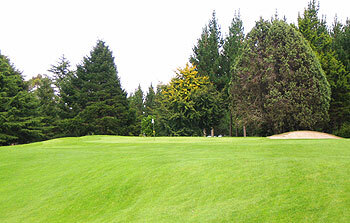 The course itself is a traditional New Zealand tree-lined parkland layout, split by a road that used to have a par three played over it, before it gained its status as State Highway 50. Off the backs, it stretches to 6,587 yards (6023m), with some very testing par fours. The club’s professional believes that while the 3rd hole (named The Ridge) is the most renowned, the 435-yard (398m) dogleg left 13th may be the toughest, with out of bounds to the right, and a raised green. As well as that inaugural NZ Open, the course has been the site of many New Zealand and inter-provincial tournaments, such as the NZ Amateur (men and women), Freyberg Rosebowl, and the Interprovincials. I was taken round Napier on a bright Sunday morning by a couple of members, top-notch gentlemen they were (Fraser and Julian). I thoroughly enjoyed my round with them, and really wanted love their golf course, but unfortunately I can’t find much particularly special to say about it. This is yet another traditional Kiwi parkland track, which means a bland paddock, with fairways separated by lines of trees that suffocate most drives, limiting strategy and a lot of the potential for bold recovery shots. It’s a model you’ll find everywhere, North and South Island, and it’s a real shame that in this astounding country, with terrain suited for incredible golf courses round every corner, has so many club courses like this. Having said that, Napier does at least have some undulation to play with, and there is a more strategic stretch running from 9 to 14, that consistently rewards a bold line off the tee or a well-shaped drive, whilst leaving the option of safer bail-out areas that will leave you penalised for your next. They are even fairly balanced in terms of which shape of shot will be rewarded (3 draws and 2 fades). This for me this is undoubtedly the part of your round that should hold your interest, because the other 12 holes are mostly mediocre processions down tree-lined avenues. I will credit some of the bunkering as being pretty pleasing (there are some nice examples round the greens on 5, 9 and 11), with some steep faces and wicked collection areas, although unfortunately many of the greens are a little round and flat for me to proclaim Napier as having ‘great green complexes’, or anything like that.